Located opposite the beautiful Lac des Rousses and a few minutes walk from the Nordic ski slopes. Les Rousses is a family resort or tourism naturally blends with the local life. Taste the cheese melted and Jura before escape in wines flavors and valuable ripening cellars County. The facility is situated 2 km from the resort center. Shops Available: Bakery, pharmacy, banks, Cheese, Sausages, supermarket, post office, sports shops and Tourist Office, restaurants and bars, doctors. Welcome to the museum! : The Boissellerie and trades of the Wood, the museum of the polar worlds, the museum of the telescope in Morez! 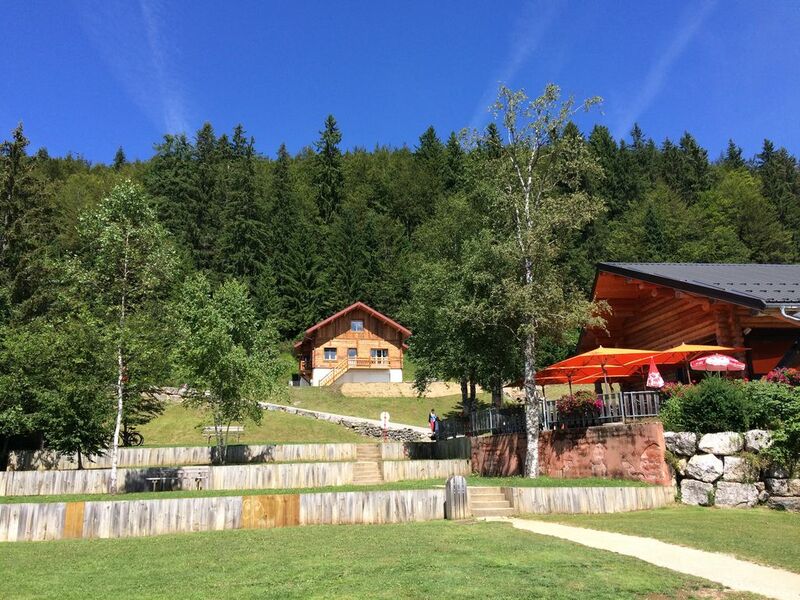 The chalet des Rousses is a lodging of. 120m2 on 2 levels, It is composed of a kitchen and a living room, 2 bedrooms (with bed 140 in each room) and a dormitory floor with 1 bunk beds for children and a bed of 140 (double), a bathroom (bath), with separate WC, and a basement with garage. The house also has a balcony. Equipment: Plate vitro, oven, dishwasher, washing machine, raclette and pierrade apparatus. chalet confortable, avec une vue magnifique,propriétaire très disponible et accueillant, ajouter à cela une semaine de soleil, nous avons passés des vacances formidables et inoubliables. merci Lucie!!!. Un endroit confortable et accueillant, très pratique et situé idéalement. Vue imprenable. Toutes les facilités à proximité. Les propriétaires sont très aimables et cool. Nous recommandons chaudement! Alles O.K. Electrische rolluiken overal is een groot pluspunt om het huis fris te houden. 4 kano's + boot + fietsen + baby-foot ter beschikking. Mooi zicht, goede matrassen en hoofdkussens. Veel gezelschapsspelen aanwezig, jeu-de-boules-plein rechtover de deur. Goede zwemplaats, via trapje, dichtbij Les Rousses-centrum. Voldoende keuken-uitrusting. 2 parkeerplaatsen ter beschikking..
A perfect base for a week of cycling in the Jura. Modern big and clean with the possibility of kayaking (canoe is included) in front of your door at the lake. Sehr gut ausgestattete Küche, großer Esstisch, 2 nette Zimmer mit (schmalem) Doppelbett. Offene Wendeltreppe zum Obergeschoss mit vielen Matratzen. Kajaks kostenlos, Garage vorhanden zum Fahrrad Abstellen. Sehr nette Vermieterin, problemlose Übergaben. Leider direkt an der Straße gelegen, daher bei geöffneten Fenstern recht laut, auch wenn nachts/morgens wenig Verkehr ist. Großer Supermarkt in Les Rousses, ca 2 km, gut mit dem Fahrrad erreichbar. Lac des Rousses: Klarer See, schön zum Schwimmen, Schnorcheln, Kajak Fahren etc. Renting so ideally located opposite the Lake des Rousses. Ideal for swimming, walking but also for water activities that have the lake (kayak, paddle boating ..). The Jura is a region where winter skiing and hiking (ATV) is ideally convenient. You can also enjoy many activities proposed by the resort of Les Rousses.